Latino registered voters prefer President Barack Obama over Republican challenger Mitt Romney by 69% to 21% and express growing satisfaction with the direction of the nation and the state of their personal finances but are somewhat less certain than non-Hispanics that they will vote in this election, according to a new nationwide survey of 1,765 Latinos. The survey was conducted from September 7 to October 4, 2012, by the Pew Hispanic Center, a project of the Pew Research Center. Obama’s current lead over Romney among Hispanics has barely budged throughout the 2012 campaign and is larger than in the 2008 election, when he received 67% of the Hispanic vote to 31% for Republican John McCain (Lopez, 2008). The new survey also finds a sharp rise in the past year in the share of Latinos who identify the Democratic Party as the one that has more concern for Latinos. Some 61% say this now, up from 45% in 2011. Just 10% say this about the Republican Party, down from 12% in 2011. The Latino electorate is growing in size and importance. Today some 23.7 million Hispanics are eligible to vote, an increase of more than 4 million since 2008. Hispanics now account for a record 11.0% of the nation’s eligible electorate, up from 9.5% in 2008 (Lopez, Motel and Patten, 2012). With the turnout rate of eligible Latinos voters historically lagging behind that of other groups, the new survey finds that 77% of Latino registered voters say they are “absolutely certain” they will vote this year. By comparison, 89% of all registered voters say the same in a separate Pew Research Center survey (2012b) of the general public taken at the same time. Likewise, 61% of Latino registered voters say they have thought “quite a lot” about the upcoming presidential election, compared with 70% of registered voters in the general public. At the same time, however, fully two-thirds (67%) of Latino adults say they believe the Latino vote will have a “major impact” on determining who wins this year’s election. According to the new survey, fully 97% of all Latino registered voters—as well as a nearly identical 95% of Latino registered voters in those 11 states—say they are confident they have the identification they will need to vote on Election Day. 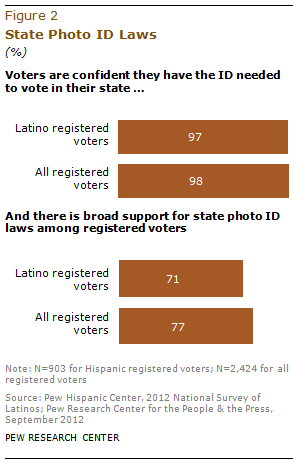 The survey also finds broad support among Latino registered voters for voter photo ID laws; 71% favor them, nearly as high a share as among the general public (77%). 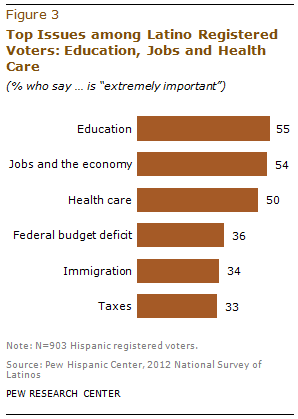 Education, jobs and the economy, and health care are the top issues for Hispanic registered voters. Some 55% of registered voters say the issue of education is extremely important to them, followed by 54% who cite jobs and the economy, and 50% who cite health care. These three top issues are the same as those cited by Hispanic registered voters in December 2011 (Lopez, Gonzalez-Barrera and Motel, 2011). About a third (34%) of Hispanic registered voters say immigration is extremely important to them personally; similar shares say the same about the federal budget deficit (36%) and taxes (33%). This report is based on a nationally representative bilingual telephone survey of 1,765 Latino adults, including 903 registered voters. The margin of error for the full sample is plus or minus 3.2 percentage points at the 95% confidence level; for registered voters, the margin of error is plus or minus 4.6 percentage points. The survey was largely conducted before the first presidential debate, which occurred on October 3, 2012. For a full description of the survey methodology, see Appendix B. In the nine so-called battleground states in the presidential election—Colorado, Florida, Iowa, Nevada, New Hampshire, North Carolina, Ohio, Virginia and Wisconsin3—Obama holds a 65% to 23% lead over Romney among Latino registered voters. In the non-battleground states, Obama’s lead is 70% to 21%. Obama holds a 72% to 22% lead over Romney among Hispanic registered voters who say they are “absolutely certain they will vote” this year. Among Hispanic registered voters who say they may vote, Obama’s lead over Romney is smaller—66% to 20%. Across nearly all major demographic groups of Latino registered voters—by age, gender, educational attainment, language use and immigrant status—Obama holds a greater than 2-1 lead over Romney. Democrats hold a widening advantage over Republicans among Latino registered voters in party affiliation. Seven-in-ten (70%) Latino registered voters say they identify with or lean toward the Democratic Party, while 22% say the same about the Republican Party. In 2008, this margin was 65% to 26% (Lopez and Minushkin, 2008). Two-thirds (67%) of adult Latinos say the Latino vote will have a major impact in determining who wins the 2012 presidential election. Foreign-born Hispanics are more likely than the native born to say the Latino vote will have a major impact on this year’s election—72% versus 62%. Nearly nine-in-ten (89%) adult Latinos say they approve of President Obama’s recently announced policy that allows unauthorized immigrants who were brought to the U.S. as children to remain in the country and apply for temporary work permits if they meet certain conditions. Among Latino registered voters, 86% say they approve of the program. Three-in-ten (31%) Hispanic adults say they know someone who has applied for the new deferred action program. Among Hispanic registered voters, 26% say they know someone who has applied for the program. One-in-four (26%) Hispanic adults say they personally know someone who has been deported or detained by the federal government for immigration reasons in the past 12 months. Among Hispanic registered voters, 22% say the same. About four-in-ten (42%) Hispanic registered voters say their personal finances are in “excellent” or “good” shape, up from 31% who said that in 2011. Among registered voters in the general public, some 48% rate their finances as excellent or good, up from 42% last year. Most Hispanics are optimistic about their financial futures. Seven-in-ten Hispanics (73%) and Hispanic registered voters (70%) say they expect their family’s financial situation will improve in the next year. Hispanic registered voters are more upbeat than the general public about the overall state of the nation. Some 45% say they are satisfied with the direction of the nation, compared with 28% of all registered voters. Both figures have risen in the past year. The 2012 National Survey of Latinos (NSL) focuses on Latinos views and attitudes about the 2012 presidential election. The survey was conducted from September 7 through October 4, 2012, in all 50 states and the District of Columbia among a randomly selected, nationally representative sample of 1,765 Latino adults, 903 of whom say they are registered to vote. The survey was conducted in both English and Spanish on cellular as well as landline telephones. The margin of error for the full sample is plus or minus 3.2 percentage points. The margin of error for the registered voter sample is plus or minus 4.6 percentage points. This report was written by Associate Director Mark Hugo Lopez and Research Associate Ana Gonzalez-Barrera. Paul Taylor provided editorial guidance. The authors thank Paul Taylor, Scott Keeter, Leah Christian, D’Vera Cohn, Michael Dimock, Richard Fry, Cary Funk, Rakesh Kochhar, Luis Lugo, Jessica Martinez, Rich Morin, Seth Motel, Kim Parker, Jeffrey S. Passel, Eileen Patten, Antonio Rodriguez and Greg Smith for guidance on the development of the survey instrument. Taylor provided comments on earlier drafts of the report. Motel, Patten, Martinez and Parker number-checked the report text and topline. Marcia Kramer was the copy editor. “Foreign-born U.S. citizens” refers to persons who indicate they are “foreign born” and U.S. citizens. The terms “foreign-born U.S. citizens” and “naturalized U.S. citizens” are used interchangeably in this report. “Eligible voters” refers to persons ages 18 and older who are U.S. citizens, regardless of whether they are registered to vote. “Battleground states” were identified by the Pew Research Center using state ratings in September from The Cook Political Report, MSNBC, The New York Times, Real Clear Politics, Karl Rove, CNN, Pollster.com and The Washington Post. These states are Colorado, Florida, Iowa, Nevada, New Hampshire, North Carolina, Ohio, Virginia and Wisconsin. “Photo ID states” are those classified by the National Conference of State Legislatures (2012) as requiring photo identification in order to vote. For the current presidential election, photo ID laws are in place in these states: Florida, Georgia, Hawaii, Idaho, Indiana, Kansas, Louisiana, Michigan, New Hampshire, South Dakota and Tennessee.